Happy National Library Week. 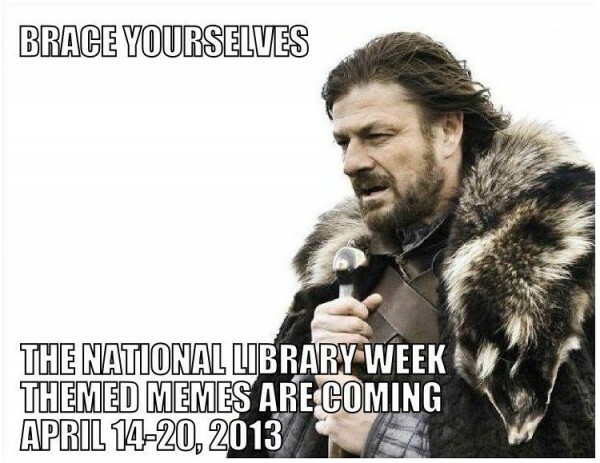 This is the week that encompasses a few more days worth celebrating including National Library Workers Day on Tuesday, National Bookmobile Day on Wednesday and Support Teen Literature Day on Thursday. Oxford University Press is giving away free access to the OED for folks in North and South America through Saturday. That’s sort of neat. I just got back from a very fun time giving a keynote speech at NETSL (more on that later) which was the first talk I’ve given all year. This was after Flavorwire’s “Coolest librarians alive” list which made me go “Who is Flavorwire again?” and then “Oh, neat” But my favorite thing about that accolade was what happened afterwards. A bunch of people instead of being normal crabby internet people in the comments section, actually started naming other librarians who they thought were cool, or great, or excellent, or important. And people talked about it online in the usual places, a lot. The article (more of a listicle really) was so popular they added a second set of librarians a Readers Choice with 10 more cool librarians. And that, in a nutshell, is why I become a big goofball during National Library week and bug all my friends to get cards and take themselves to the library and why I stopped at the Somerville Library to check out their Awesome Box yesterday when I was nearby. Because I get to work with and around a lot of neat people and in many ways we’re a team. Sure there are some showboats and various rockstars in various areas and niches, but it’s great to see people being not just happy for whoever some website thinks is cool but also to talk about the other cool librarians that they know and why they’re people you should know. It’s a great group of people.